By the 1972 model year it became apparent the muscle car era was over. This was a time when many automakers were dropping muscle car models left and right – and the ones that remained were encountering massively declining engine horsepower, the likes of nothing ever seen before in the automobile industry. Add to that the skyrocketing insurance rates for muscle cars and you can see the formation of the perfect storm that swallowed up most muscle cars during the 1970s. When the Pontiac GTO was released for the 1964 model year, it started the muscle car craze, within a few short years there were so many other competitors, it seemed like the sky was the limit by the late 1960s for the muscle car. By 1972, things were beginning to look pretty grim with only 5,807 GTOs produced. To put this into perspective, this was almost half the production of the 1971 GTO which was 10,532 units. And that was about 25% of 1970 GTO production which was 40,149. And before you start thinking 1970 was a banner year, 1970 GTO sales were only about 41% of the sales of the GTO’s best year which was 1966 when 96,946 GTOs were produced. And it wasn’t just the GTO that was getting clobbered by 1972, most muscle car models were experiencing the same fate of declining sales. The paltry sales figures for 1972, didn’t mean that the GTO lacked the goods, in fact it was better than ever. The general overall body style had been around since 1968, but Pontiac had updated the front and rear styling almost every year. 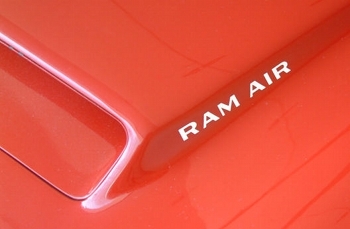 And even the quarter panels took on a new (creased type) shape starting in 1970. In its fifth year with the same body style the 1972 GTO was still ahead of much of its competition in terms of styling due to these almost yearly updates. After-all no other muscle car had a stylish Endura front-end (with the exception of the Pontiac Firebird and Trans Am). The Endura was a front bumper which consisted of a flexible plastic type material – it’s similar to the type of flexible front bumpers used on just about every new car a truck today. Back in 1972, just about ever car was still using a metal front bumper. The Endura front bumper allowed Pontiac stylists to craft the GTO’s front end into a work of art which would have been so much harder to do with a steel bumper. The over-all styling was the subjectively the best yet for the GTO with four headlamp front-end with large Pontiac twin grilles – the Endura front bumper which was painted in the exterior color was indeed the finishing touch. The rear design was essentially the same (used on the previous two years) with a large wrap-around chrome bumper with two long horizontal taillights (one on each side) which also wrapped around to the rear quarter panels. Pontiac had pondered painting the large rear chrome bumper body color for the GTO before the 1970-1972 rear bumper was released (since the front Endura bumper was body color) – but in the end Pontiac decided against it. This wasn’t such a bad thing, especially since the chrome bumper matched the chrome exhaust pipe outlets. For 1970-1971 the GTO had quad exhaust outlets (two on each side of the rear under the chrome bumper. For 1972, Pontiac moved the chrome tipped exhaust outlets to under the rear quarter panels directly behind the rear tires (with two tips on each side of the car). It was the same type of setup that was first seen on the 1964 GTO. 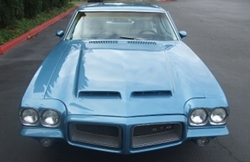 And unique to the 1972 model year, the GTO received air extractors on the front quarter panels behind the front wheel wells – it would be the first year for these and the last. The bad news for the GTO was that it no longer was a separate model as had been the case since 1965. Just like its first year, the 1972 would again be relegated to an option package. For 1972, one had to order a Pontiac LeMans with the W62 package to get a GTO. And to add to the sting, the top-of-the-line GTO Judge model had been dropped for 1972. Besides what was previously mentioned, the GTO package for 1972 gave a buyer a 250 horsepower 4-bbl 400 CID V8, a standard 3-speed floor mounted shifter, (black sidewall) 14 inch wide oval performance tires, a twin scoop hood, a standard dual exhaust system, firm shocks, and both a front and rear stabilizer bar. The W62 GTO package was available for both the LeMans 2-door (post) coupe or the LeMans 2-door hardtop. The post coupe had front vent windows and a visible post between the front side and rear side windows (the post was easily seen when the front and rear windows were down). The hardtop didn’t have front vent windows or posts – when the side windows were down the area was completely open. The only advantage to the post coupe was it had a very low base price of $3,108 versus the $3,237 for the hardtop. Not many GTO buyers opted for the post coupe since only 134 were produced for 1972. This was not surprising since the better overall look of the hardtop when compared to the post coupe was worth the extra $129. The standard 400 V8 had enough punch to compete with most of the remaining competition for 1972. If Pontiac had just offered the 400 V8, most GTO fans would have felt as if the name was still honored. Compression ratios had dropped for 1971 on all GM engines, not to mention that by 1972 new stricter (SAE net) horsepower standards now were in effect. Whichever way you cut it the D-port 400 had taken a massive horsepower plunge, after-all in 1970 this engine was rated at 350 gross horsepower. The positive was all of the GTO’s competition had encountered the same horsepower free fall. So with that in mind 250 horsepower seemed pretty good. And since the GTO still had big cubes, its base motor produced a very respectable 325 lb-ft of torque. And for those wanting a few more cubic inches, a D-port 455 CID V8 was on the GTO option list. It was rated a 250 horsepower just like the 400, however its 375 lb-ft did make it worth the extra price of admission. Both the 400 and D-port 455 could be equipped with a M40 (TH400) Turbo Hydramatic 3-speed automatic transmission or the 4-speed manual transmission (fortunately most people passed over the standard 3-speed manual transmission). However for the buyer who wanted the ultimate in performance the 1972 GTO’s WW5 option package was really the only choice. Central to the WW5 package was a round-port 455 (CID) HO V8. It may have only had a 8.4:1 compression ratio, but don’t be fooled, this was one of the best high-performance motors ever offered in a GTO. The heads had big valves and screw-in rocker arms. A free-flow intake manifold and a set free-flow cast iron exhaust manifolds were also standard on the 455 HO. 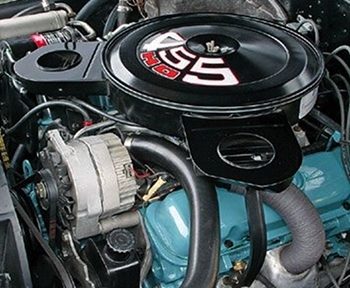 The 455 HO also had an 800 cfm Rochester Quadrajet 4-bbl carburetor. The WW5 package also included a cold air induction package which opened the flaps on the two hood scoops to allow cold air into the engine through the air filter assembly (which was not available with the 400 or D-port 455). Pontiac rated the 455 HO at 300 net horsepower and 415 lb-ft of torque. Truth be known, even though the 300 horsepower figure was one of the highest a buyer was going to find in a new 1972 model year muscle car, it was still well under the 455 HO’s real output. A buyer could expect very high 13 to very low 14 second 1/4 mile times with the 455 HO. With the WW5 either a 4-speed manual transmission or TH400 3-speed transmission was available at no extra cost. By default the GTO was still a stripper car. For instance bucket seats and a console were still optional items. If a buyer wanted these items standard Pontiac offered the sporty and more luxurious Grand Prix. However this didn’t mean that most 1972 GTOs were ordered with no options. Quite the contrary, a majority were in fact loaded with these options and many others. However one option that was a must with the 1972 GTO was the D35 – outside body colored sport mirrors. Since the GTO by default didn’t come equipped with a tachometer, it was also imperative that a buyer order the optional U30 rally gauge cluster-tachometer. The (14 inch) Formula steering wheel (with black padding) which first became a GTO option in 1970, was a must have since not only did it spruce up the interior but it was so easy to grip even in performance related turning maneuvers. However one way to get some of these sought after options along with others was to go with the WW5 package. The body colored side mirrors, a Formula steering wheel, roof drip scalp molding, power front disc/rear drum brakes, custom interior carpet, and a rally gauge cluster with tachometer were all standard with the WW5. However the hidden gem of the WW5 package was the Y99 handling package, which was a nice step up from the GTO’s standard handling package. 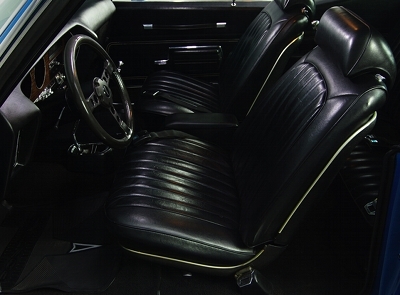 The interior of the GTO was still attractive even though it was largely unchanged since 1968. There was a slight dash design layout update for 1969 (which mostly affected the passenger side), however the 1972 dash remained largely unchanged from the 1969 update. Since the GTO was no longer a separate model and only an option package for 1972, there was a silver lining for those who didn’t want to spend the extra money for the GTO option package. A run-of-the-mill 2-door LeMans could now be ordered with the GTO’s performance options. And here’s where it got interesting, a buyer could order a 2-door LeMans with the GTO’s front Endura bumper, twin scoop hood, and front quarter panel air extractors. It was possible for a buyer to purchase a LeMans that was an exact clone of even the WW5 equipped GTO. The only way to tell the difference was looking for the "GTO" badges which the LeMans didn’t have. This was especially important for convertible buyers since Pontiac dropped the convertible option on the GTO for 1972. The only way to get a GTO convertible for 1972 was to order a LeMans convertible and equip the convertible with the GTO’s front Endura bumper, hood, and air extractors. The "GTO" badges may have not been there, but at least a LeMans so equipped looked just like what a GTO convertible would have looked like had Pontiac produced one for 1972. The bad news was 1972 would be the last year of the original muscle car era high-performance GTOs. Pontiac starting in 1973, would reserve its best engines for Pontiac Trans Am and Firebird Formula – both would get the legendary Super Duty 455 V8 option for 1973 and 1974 and the GTO would not. The 1973 GTO would be only available with the D-port 455 and 400 V8. It was a sign Pontiac had passed the performance torch to the Trans Am and Firebird Formula. For 1974, the GTO option would move to the X-body Ventura and it would be equipped with only a 4 bbl 350 CID V8 rated at 200 horsepower. This would be the last year for the original GTO run, Pontiac would revive the GTO name again in the form of a rebadged 2004-2006 Holden import from Australia, however it wasn’t the same. 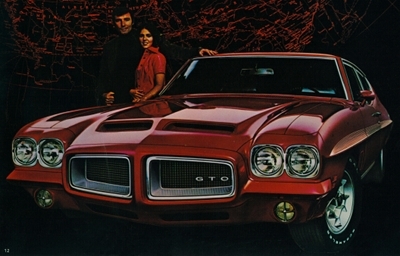 Upon reflection the 1972 model year was the swan song for the GTO. Had more people realized this at the time, surely a lot more than 5,807 GTO buyers would have surfaced.